Sellsy's product management section is consistent with the inventory management add-on. Inside this section, each product variation has its own inventory management. Inventory management for products with variations can be made by weighted average cost or by serial number. For example, you can easily manage computers with a variant for screen size, with different characteristics (processor, hard drive space, etc.). Important: It is imperative to activate stocks only after creating variants for the product. 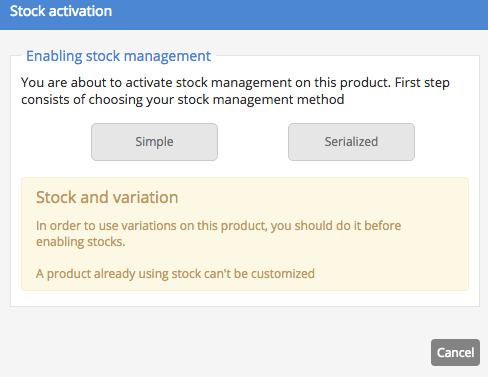 To activate inventory was product with variations, open the product and after creating variations, click Enable stock. This above box appears in the window. After clicking, go through steps as you normally would for regular product stocks. The stocks are activated for all variations and are initiated with the default settings. From there, you can manage your inventory as you would for a standard article. To do this, go to the page by clicking close variant View to the right of the line variant.